There’s some Mopologist on Mopologist fighting going on today with Stephen Smoot taking a shot at the Heartlanders in this blog post. I know this is esoteric stuff that doesn’t appeal to most people, and I feel a bit embarrassed to admit I like this topic, but here is my take on BOM geography. I’ve been making notes on Book of Mormon geography for the purpose of making an extended analysis of it. I’ve got a 30 page Word doc now documenting BOM geography theories and the BOM verses that cover the geography, along with summaries of various theories. It’s very interesting to me, but not enough to put it all together. 3. Hemispheric model covering the entire North and South America continents. I believe the hemispheric model is what the Book of Mormon author intended to convey. It fits very well with the text and with how Joseph Smith and early saints talked about and understood the Book of Mormon. There is one data point that’s off, and that is the issue the LGT’ers jump on to claim the BOM took place in a small area. That is Mosiah 24 where it took 21 days to travel between Nephi and Zarahemla. But I think all the models have problems and the Hemispheric model is most accurate, in terms of what the author meant. I am purely looking at this from an internal textual basis, with no weight given to historical and scientific evidence not contained within the text of the Book of Mormon. I believe the Book of Mormon is scripture, the Word of God. Its message is a powerful witness of Christ and has been transformative in millions of lives, including my own and many others I have seen first hand. I don’t believe it is historical, but I believe it is miraculous, inspired, and inspiring. It’s consistent and complex in many ways. The geography is an important part of that complexity. I think Joseph Smith mapping out potentially where the Book of Mormon should be set, geographically, was likely a part of the process of the inspiration process where human creativity intersects with the divine to create an inspired work. 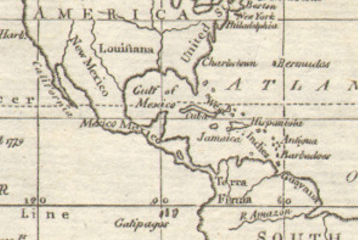 I think the narrow neck is clearly intended to be the Isthmus of Panama, with South America as Lamanite country and North America as Nephite territory. Jaredites also were North America. The Pueblos are in the right spot. The distances don’t make perfect sense, but they’re reasonable. 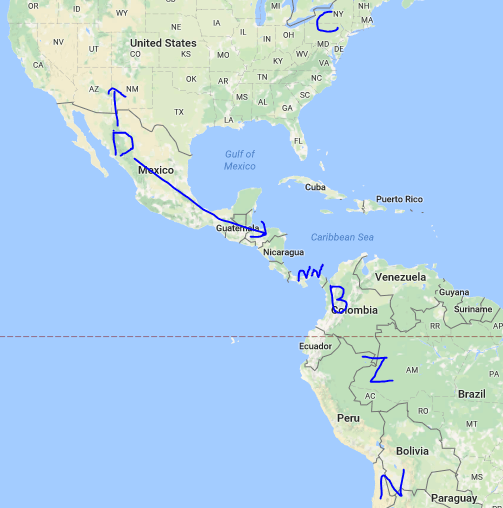 A ship is required to send timber up to the barren north Mexico-southwestern US area, because of the long distance. Only one Cumorah. But then I found this map from 1796. In this map, the Isthmus of Panama is just about equal to the narrow neck of land of the Isthmus of Tehuantepec in Mexico. Before the Panama Canal was built in the early 1900’s, the Isthmus of Tehuantepec might have been the higher profile “narrow neck” in Central America. One of the weaknesses of the model is the distance to Cumorah, so this alleviates that a little, so this map is also an alternative. This also is nice because it maps out three civilizations that Joseph would have known about, roughly in the right spot. Zarahemla and Bountiful is Maya territory. Nephi and the Lamanite land down south is the Incas. And the pueblo sounding civilization in the area occcupied by the Pueblo tribes. Not that the BOM describes actual ancient civilizations, but that the author did some proper due diligence in mapping it all out realistically. I don’t love the LGT, primarily because it puts an emphasis on historicity and literalness and weird things as a result of it, like whether or not MesoAmericans did this or that. I don’t like it because it takes away from what is important about the book. I also don’t like it because it decreases the scope. The Book of Mormon was an ambitious book. It was meant to be an origination story for Native Americans. It was meant to apply to the entire continent of America. It’s big. The LGT makes it small. It shoves it into the background and makes the people insignificant. Small is not what the author, who I believe is Joseph Smith through the inspiration of God, intended it to be. Even though, I view the historical aspect of it as not literally true and meant to have metaphorical value, I still think it’s valuable to receive the book’s internal text the way Joseph Smith and God intended it. I appreciate the work you’ve done here, but since I let go of the idea of the BofM being historical, all claims of BofM geography ring hollow to me, and are nothing more than fanciful speculation. These theories might be interesting to think about once in a while, and may even be an amusing hobby for some, but I wouldn’t build a testimony on any of them. I pity the apologists who really sweat over the actual locations of BofM events, who may have testimonies and careers hinging on it. And I’m very suspicious of some BofM geography adherents, like those LDS tour operators in Mexico, Guatemala and elsewhere who claim to know exactly where everything really happened, and personally profit by representing their own opinions as not only fact, but as spiritual truth. But I can get on board with the idea that JS put some thought into the geography of the BofM, possibly informed by the maps and geographical knowledge that would have been available at the time. I can’t wrap my head around why the geography matters if the book has no literal foundation. Why does it matter if it’s “big” if it’s not real? It sounds like you accept the book as divine metaphor but feel the metaphor is diminished by the LGT, whereas to me, if it’s just divine metaphor, how could such a particular as perceived geography diminish it? But I guess that’s because to me, if the book is just divine metaphor, it’s already so diminished that the geography wouldn’t matter. You say that you think the Hemispheric model is the strongest based on textual evidence. But the only textual evidence mentioned is the 21 day journey listed in Mosiah. You don’t offer any textual evidence to explain why that verse doesn’t disqualify your thesis, or any that support yours. In fact, your entire post is generally lacking in specifics, especially compared to Smoot’s article. I know this was thrown together quickly but you don’t do yourself and your viewpoint any favors when your dismissals of LGT consist of run on sentences about “literalness” and “weird things” without a evidence. I’ve mentioned before that I generally like you and have no problems with what you say except when you scoff at what you call LGTers. When you can’t restate their position accurately and you don’t offer specific analysis or scriptures it makes me think you are being even more dogmatic than the historicity folks that you think are dogmatic. (Again I know this was produced on short notice, but it doesn’t take that much extra effort to add some verses that you think specifically supports your case.) I’m fine with different arguments and view points, but when you complain that other sides are too simplistic or literal you should make sure that you aren’t making those arguments from a glass house. On the scope of the BoM being limited by the limited geography model: The God of the world suffered and died in a small backwater province and He showed his power to calm the storm on a sea that was really a small lake. The BoM is a grand and amazing book even if some people want to acknowledge the geographical realities in the book instead of the broad and often facile assumptions about the book. As someone who prides himself on being able to discern the pure intention of the (fictional) ancient authors of the book, this is a rather surprising (to say nothing of highly debatable) claim. I guess my only other question is whether Joseph Smith was plagiarizing these maps of the North American continent before or after he plagiarized the Carsten Niebuhr maps of Arabia. I’m sort of with Jack Hughes on this. The theories could be interesting, I suppose, but such conversations among apologists smack of desperation and pseudo-scholarship to me. And it is absolutely astonishing to see the number of Book of Mormon tours that are offered in Mexico and Central America. One site promises “uplifting tours”, which I presume means tours that don’t mention the fact that the B of M ‘s “truth” isn’t supported by archeological or anthropological methods and that Central America is just guesswork as a possible location for what purports to happen in the book. Because, you know, facts aren’t very uplifting. Sheesh. I think this is a great post, thanks a lot. I like how the post is “big picture” , don’t get lost int he details. And they theory is that way too. I like to think of the BoM these days as operating in an alternative dimension, an alternative universe in the multiverse. Kind of like a Orson Scott Card series, “Seventh Son”. It is American-history like but in an alternative kind of universe where George Washington got his head cut off by the British, if I recall correctly. Or the Golden Compass series where there are different Oxford Englands in different worlds , and they are all similar but yet different from each other. If there really are multiple universes out there then the BoM could have happened in any of them. Maybe to understand Book of Mormon Geography and History better we should spend more time studying Physics and less time with Geography and History. In that sense, I think this post could be moving us in the right direction. In addition to what you’ve said, there are variations of Great Lakes Theories, Malay Peninsula, South America (usually Chile), and the Baja theory. Apparently there is an African theory too. I’m with those who say that if the Book of Mormon is not historical, then all the geography theories are irrelevant and hollow. I do think the Book of Mormon is historical, but I still ignore all the theories. “But I think all the models have problems [BUT AS I WAS SAYING…]” I think a more intellectually honest appraisal of BOM geography would do much, much more to assess the problems you refer to. Like, wouldn’t the 21-day Nephi-to-Zarahemla travel time completely torpedo your “hemispheric model”? Explain to me how it wouldn’t. Hope sure does spring eternal when it comes to the ever-narrow path to claiming historicity. Book of Mormon geography is not geography, it is literary analysis. It’s like debating the geography of Middle Earth (Tolkien at least supplied maps as part of the text). Some people think Middle Earth is in New Zealand (they have actually visited Hobbiton there, a pretty good claim). Some think it bears uncanny resemblance to England and have even made convincing links between features in the text and locations near the area where the author grew up. Others see the events tied closely to Europe, with the struggle between good and evil set in Middle Earth as the author’s recasting of the struggle between good and evil in 20th-century Europe. Tolkien participated in the fighting in WWI and his sons in WWII. I think the endeavor is interesting, regardless of the historicity. As a literary work, it is helpful to understand the intent of the author. A hemispheric vs LG changes the meaning of the etiology of the book. If intended just to document a small society, that is ultimately swallowed up by the Mayan culture, is very different than a story about the origins of an entire continent of people. Allowing for it not to be historical allows the reader to feel the grandiosity of the story. Having read the Old Testament I have to disagree. The meaning isn’t reduced by the small scale. Even Noah, when it becomes obvious that other humans survived the flood from the Bible’s language—that doesn’t change the message. How about if the BOM is totally true in a strictly metaphorical sense? That there is no specific place that holds the story?? That JS wrote it through inspiration, that he had the plates and other things that were or were not directly related to what he wrote, but God inspired him to write a story that would inspire and convey eternal truths, but was spiritual and metaphorical? That could be the case and the BOM would still be true. 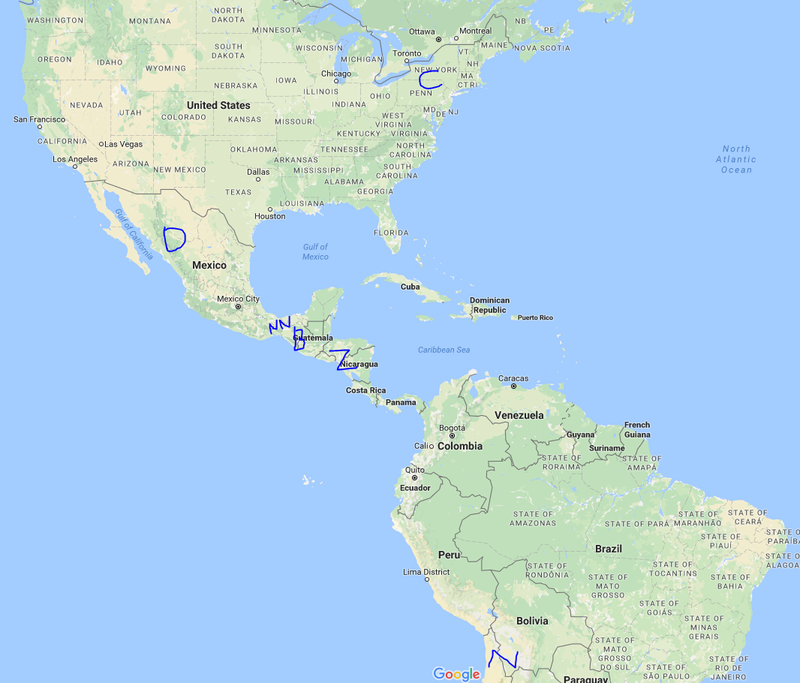 the geography he wrote about might have come from his knowledge of geography and the inconsistencies come from JS’s incomplete knowledge of Latin American Geography. That does not make the truths in the BOM invalid. I honestly think the evidences for the “Andes with the Amazon basin under water before Christ” model has — by far– the most compelling evidences. Check it out starting here: https://goo.gl/fP1yCS This is the first of a 33 post overview. To go to the next post use the Menu on the right side of the webpage. Did the Andes rise in historic times? Yes, the evidence is there. Did the Andes rise at the time of Christ? Science would say no. But science can be wrong. Hmm, I actually kind of like what you’re getting at here. It seems like the question you’re asking is not, “Where could the Book of Mormon events have taken place?” but rather “Where did Joseph Smith intend for those events to take place?” This question still seems meaningful even if you don’t believe that the BOM is historically true. One possibility that occurs to me is that JS did not have any real location in mind and just based the story on a geography he had constructed mentally but had loose connections to real world locations, much like Phil and Dave B suggested in their comments. In this case, trying to tie BOM events to real places is much like trying to figure out where Hobbiton is, although it can still be interesting (but probably not too useful) to examine the geography on its own terms and notice some correlations with real locations, like you’ve done here. I couldn’t help but think about this discussion when listening to our sacrament meeting youth speaker today. He told us about the saga of the HMS Resolute, how it’s explorers were looking for the Northwest passage, they got stuck in the ice, abandoned the ship and ate penguins to survive. Ultimately, the leader was able to guide the exploration team back to safety without losing a single person. Somehow the youth managed to get the story of Sir John Franklin’s 1845 ill-fated exploration of the Northwest Passage (with the HMS Erebus and HMS Terror in which both crews perished), mixed with the HMS Resolute, a ship sent to find Franklin’s expedition in 1852, and Ernest Shackleton’s exploration of the Antarctic in 1914 (on the Endurance). Since the scout told us he was relating the story as told to him by a leader at scout camp, I’m not sure where or how it got twisted. The story, as told by the scout on it’s face, isn’t true – penguins don’t inhabit the Arctic and the HMS Resolute wasn’t looking for the Northwest Passage. The record is unclear on whether all the HMS Resolute crew survived – though I presume most did. On the other hand, there are elements of the scout’s story that are true. All the ships (HMS Erebus, HMS Terror, HMS Resolute, and the Endurance) became ice-bound and were abandoned. The HMS Erebus and HMS Terror were looking for the Northwest Passage. The crew of the Endurance ate penguins to survive and Ernest Shackleton did lead all of his crew to safety. The point of the young man’s story was to relate a leadership experience. Not worrying about the disconnects, one can argue his main point was achieved. After-all, a story doesn’t need to be true to make a point. But the scout thought it was true and if he stuck with the Shackleton experience, he could have achieved his point as a true story. At what point does a story move from being true to being false? If the young man correctly got every detail about the Endurance expedition, except mis-remembering the name as the Resolute, we’d be inclined to write that off as a minor mistake – he misspoke. But what to make of the getting multiple things wrong such as setting it’s location on the opposite side of the world, half a century earlier, with birds in an unlikely setting? Not being familiar with any of the stories, one would be inclined to put this in fantasy when confronted with the contradictory evidence. On the other hand, since I’m familiar with all three stories and realize they’ve somehow become conflated, I would be unable to call it fantasy – it’s all true, just not correctly told. I imagine we are seeing this type of conundrum with the Book of Mormon. Is it all true, except for the mistakes of men Moroni talks about? Are there more mistakes than that though? Are the elements correct but jumbled? I don’t know, but the young man got me thinking along those lines today.